In the morning, we're having WAFFLES! Updated: February 26, 2016 - Shorter ingredient list, with alternative ingredient options! We had the day off today for President's Day. Both Liz and I were home and one of our best and most fun friends, the incomparable Jen Check, came down to spend a few days with us and to hang out with our son, Nate (aka Nibblet.) Knowing that all of our favorite brunch and breakfast locations would be packed with hipsters with the same dining out idea, we decided not to go out for our morning repast. Alas, no Sabrina's, Sam's Morning Glory Diner or our new favorite, Green Eggs Cafe. Liz said she wanted waffles. Good thing Jen has a waffle iron that brought with her to use or else we'd still be wishing for these tasty treats. As usual, I tinkered with an already good recipe to utilize what I had in the refrigerator and to make this Double Delicious / Deceptively Delicious (by Jessica Seinfeld) recipe even more virtuous. I figured that I could incorporated a few of the recipe tricks from Double Delicious and work in some of the things I've done with my pumpkin pancake recipe (which was originally inspired by Nigella Lawson's How to be a Domestic Goddess.) Check out Jessica Seinfeld's books and website, they're all wonderful. Hey, I don't want to be hassled for copying a recipe that's not mine. I love to give credit where it's due and Mrs. Seinfeld is due a lot of credit for the inspiring ideas and healthy recipes I've been reading and writing about for the past few years. 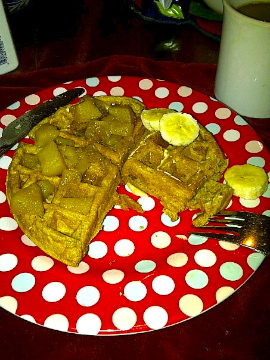 I served these waffles with real maple syrup, light butter and a combination of half with bananas and half with poached apples. In a large mixing bowl add all of the dry ingredients, whole wheat flour through cinnamon, whisking to combine. Set aside. In another mixing bowl, whisk together the eggs and egg whites, milk (or buttermilk), pumpkin and carrot (if using) purees and vanilla extract. Fold the puree mixture into the dry ingredients, folding gently to incorporated. If the mixture is too thick, add in more milk, a 1/4 cup at a time until the batter is loose but not runny. Brush the preheated waffle iron with butter or oil (Don't use cooking spray, it will cause a build-up on the waffle iron that cannot be removed). Pour enough batter into each waffle compartment to nearly fill each chamber. Close the waffle iron and cook according to the manufacturer's instructions. Carefully remove the waffle, place on a plate with paper towels between each layer and make your next waffle. Keep the waffles warmed in an oven set to 250 degrees. Serve the waffles with your favorite fruit, syrup, butters, jellies, etc. and a touch of light butter. This recipe will make 4 Belgian-style waffles or 6 to 8 regular sized waffles. Waffles can be frozen for up to 1 month. This recipe can also be altered to incorporate cornmeal, white-whole wheat flour, or a combination of whole wheat flours and other grains. I have successfully used a combination of 1 cup whole wheat with 1/2 cup each of oatmeal, cornmeal, and all-purpose flour. I find that waffles are more tender if you use buttermilk, but that can be tricky to find in a grocery store. Sometimes I use a combination of non-fat Greek Style Yogurt, for the tenderness factor, and skim milk. Use 1/2 cup yogurt and 1 cup of non-fat milk. You can also add into the waffles, shredded cheeses and chopped cooked bacon bits, to jazz up the waffles! the one thing my kitchen does not have: a waffle iron. I think my roommate would kill me if i bought one.